Julien had a mammoth day on Thursday. He left Repvag and cycled towards Nordkapp Island along a really beautiful 60km route. On the way he passed through three tunnels, the biggest of which was under the sea and 7km long. Inside the tunnel were some insane dips and equally steep rises. It was freezing cold and with a 9% uphill gradient for 4km. He stopped in at a town on Nordkapp Island called Honningsvag, where he had lunch and got ready for the last 30km. Julien said the last 30km were perhaps the hardest of the whole journey. Nordkapp Island is essentially made up of a few flat areas surrounded by mountains. After leaving Honningsvag Julien quickly hit a wall of road at a 9% incline and had to cycle up it for 6km. Julien was then stuck cycling up the edge of a large hill on a small road alongside a number of large buses. One actually ran him off the road but he persevered and made it to the peak after two and a half hours. The weather had been great all day but just as Julien reached the top it started to cloud over. Julien entered the visitors center only to discover that he had to pay to stand on the summit but they did at least offer a 50% discount for cyclists! He spoke to a few people and got a photo of himself in a prime spot. 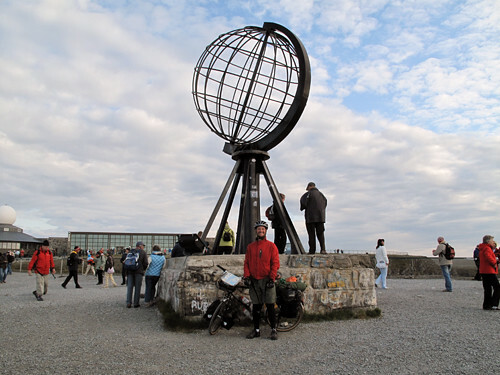 Julien says it was a great feeling to reach Nordkapp after a huge 2600 miles. What a great achievement! Just as Julien got ready to cycle back to Honningsvag his stand broke broke but this didn’t impede his progress. He made it back to the campsite where he met some friendly English speakers who were travelling through Finland. Julien had an early start the next morning. He got up at 3.50 to give himself time to tumble dry his clothes and pack up before getting the ferry from Honningsvag. The weather was great and the landscape stunning and Julien managed to get some great photos. But he dozed off and the weather turned to rain. Unfortunately the forecast for the next few days is looking pretty bad, but this won’t slow Julien down as he starts the journey home by heading towards Tromso. Here is the Google Map for day thirty one and a Google Map of the entire journey. Julien undertook his epic journey to support the Child’s i Foundation a wonderful charity that is aiming to build a home for abandoned babies in Uganda. Julien has made a great effort to cycle 2600 miles from London to Nordkapp please show him your support by sponsoring him on his Just Giving Page. Thank you! Well done Julien, hope you caught up with Knut in Tromsø! Herzliche Gratulation! Wir waren am Samstag, 11.07.2009 um 11:30 Uhr auch am Nordkapp. Congrats dude, downhill all the way to Tromso (metaphorically)… how’s the knees and weight… below 80kgs yet? Just about to start my own (substantially smaller) walkabout on Tues so fingers crossed that my various bits and pieces hold out. Good luck on the last leg, donýt forget to get some salmiakki. PS: Let me know about Iceland next year.